The “BEST OF RIO CARNIVAL”TM 2018 website’s mission is to share the happiness and joyfulness generated by the uplifting energy of the “world-renowned” Rio de Janeiro Carnival celebrations! Rio de Janeiro’s Carnival celebration of 2018 is the most amazing “mind-blowing” party in the world. Scheduled over the five day period, February 9-14, 2018, the celebration not only brings together millions of celebrants from all over the world but also its end commemorates the beginning of Lent which started 46 days before Easter 2018. 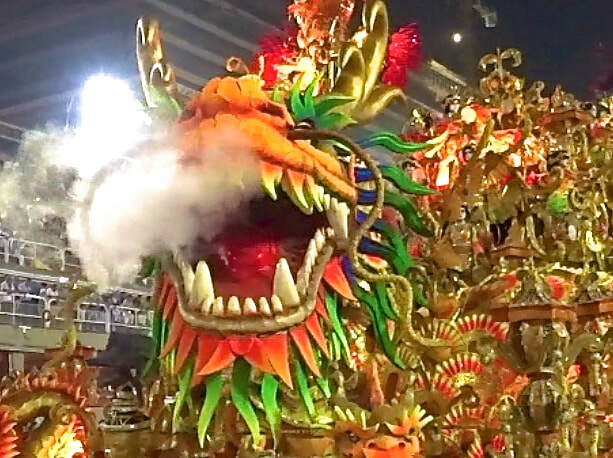 In addition to the 400+ street parties called “blocos” and the costumed lavish balls called “bailes”, the highlight of the celebration is the “world renowned” samba school “Escolas de Samba” parade championship competitions in Rio’s Sambadrome. For the first time on the internet, the “BEST OF RIO CARNIVAL”TM 2018 will present the 2018 prequel coverage of all the performances of all 26 samba schools “Escolas de Samba”. The Rio Carnival samba school parade Competitions started in about 1936 and Rio is home to over 100+ samba schools. 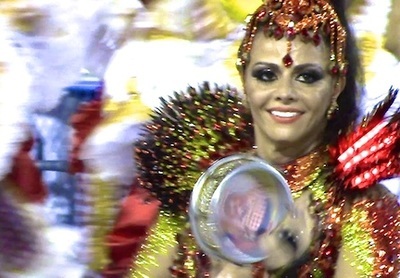 Representing poor, modest and upscale neighborhoods from throughout Rio, 26 samba schools compete every year. As with competitive sports, the schools are ranked and separated into six major divisions: the top group with 13 schools is called the "Special Group" aka “Grupo Especial”, the second tier group is the "Series A" Group aka "Access Group A" and "Grupo de Acesso” with 13 schools and, lastly, Groups B, C, D and E. While the 13 schools of the Special Group and the 13 schools of the Series A Group will be parading on the four nights of competitions in Rio’s Sambadromo, only the Special Group of schools can compete for the Championship which includes substantial financial rewards and nationwide fame and glory. (Note: the best performing Access Group school is promoted to the Special Group for the next year’s competitions while the "last place" performing Special Group school is demoted to the Access Group for the next year’s competitions. This four-night extravaganza of spectacular dance, music and showmanship takes place in Rio’s one-of-a-kind Carnival stadium, the Sambadrome. The stadium was specifically designed for the samba parade competitions and is basically a straight piece of road extending .43 miles (2,300 feet) flanked by seating on each side which can accommodate over 80,000+ celebrants who pay between $2.50 to over $1,200 USD for the privilege of viewing and cheering on their favorite samba schools amid the unmatched energy of Carnival. ​For each of the top 13 samba school’s in the Special Group, roughly 3,000 to 5.000 members sing and dance nonstop for 60 to 80 minutes, dressed in dazzling costumes atop monumental floats while slowly parading down the length of the Sambadrome to the wild cheering of fans and the intense scrutiny of the parade judges. The judges consider each school’s performance in 10 categories which will be covered in depth later. 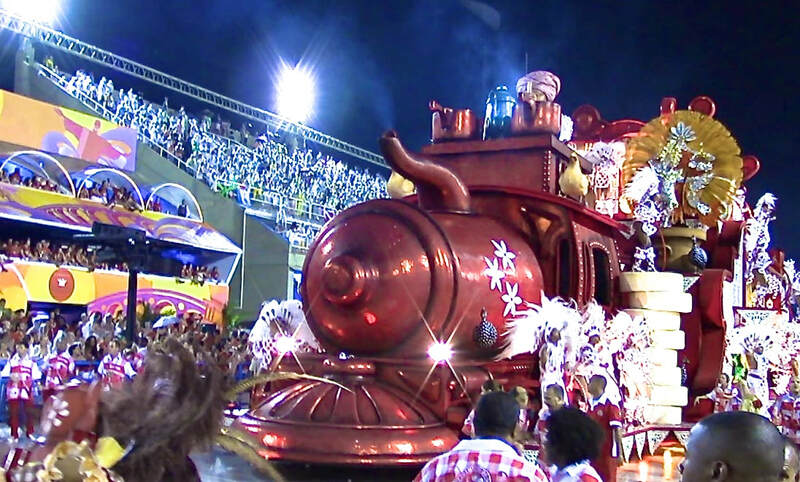 Friday, February 9, 2018, the opening day and first day of the Group A parades, in the order from first to enter the Sambódromo to last, the scheduled samba schools are: Unidos de Bangu, Império da Tijuca, Acadêmicos do Sossego, Unidos do Porto da Pedra, Renascer de Jacarepaguá and Estácio de Sá. Saturday, February 10, 2018, the second day of the Group A parades, the schedule from first to enter to last is: Alegria da Zona Sul, Acadêmicos de Santa Cruz, Unidos do Viradouro, Acadêmicos da Rocinha, Acadêmicos do Cubango, Inocentes de Belford Roxo and Unidos de Padre Miguel. Sunday, February 11, 2018, the first day of the Special Group, from first to last is: Imperio Serrano, São Clemente, Vila Isabel, Paraíso do Tuiuti, Grande Rio, Mangueira and Mocidade. ​Monday, February 12, 2018, the second day of the Special Group parades, the schedule from first to last is: Unidos da Tijuca, Portela, União da Ilha, Salgueiro, Imperatriz Leopoldinense and Beija-Flor. Throughout Rio Carnival, as in the past, for 2018, over 400 officially sanctioned vibrant street parties “blocos” take place throughout Rio. A bloco is a street party organized by a suburb, neighborhood or carnival association. The idea of a bloco is that celebrants walk behind a float (usually a “double decker” sound truck) with music from a live band on a truck or a tape being played from the truck. The celebrants usually walk around the block, thus the name bloco. The organization of a bloco is simple. All participants gather at a previously arranged meeting point. Blocos usually start one to two hours after the official starting-time and many street vendors are around to supply beers, spirits and soft drinks. The celebrations run from 8 in the morning to almost 8 the next morning. Donning homemade costumes and downing a lot of beer and cachaça (Brazilian rum), crowds numbering in the hundreds of thousands come together to celebrate and party to the beats of neighborhood bands and the energy of the celebrants.The most important, largest blocos in Rio de Janeiro are the "Cordao do Bola Preta" and "Banda de Ipanema" blocos. The “Cordao do Bola Preta” is in Rio's Centro District and is the largest street party in the world. For the last four years of Paul Hodge’s fantastic YouTube coverage of this Rio bloco, over 1,000,000 have celebrated each year! For Rio Carnival 2018, “BEST OF RIO CARNIVAL”TM will cover the "Cordao do Bola Preta" and "Banda de Ipanema" blocos and many other blocos. In keeping with the European origins of Carnival, Rio’s formal masquerade balls and nightclub parties, bailes, add an air of exclusivity to the celebration. The annual Magic Ball at the Rio’s best hotel, the Copacabana Palace Hotel, is the most exclusive Rio Carnival ball requiring guests to dress formally or wear expensive, elegant costumes. The Museum of Modern Art (MAM) hosts the Baile Glamurama which requires costumes and features live Brazilian samba music. In Rio’s Centro District, the Scala showplace hosts themed balls each night of Carnival, culminating in the boisterous Scala Gay Gala. SUBSCRIBE TO THE “BEST OF RIO CARNIVAL”TM! NO REGISTRATION, SUBSCRIPTION, MEMBERSHIP FEE WILL BE CHARGED. AVAILABLE IN ANY WAY TO ANY THIRD PARTY & NO SUBSCRIBER/MEMBER WILL RECEIVE ANY ADVERTISING.